Are You 28 Week Pregnant? Know The Changes In You And Your Baby! It is important for every pregnant woman to know that there are chances of pre-term pregnancy during 28 week pregnant. Your baby measures about 16 inches from head to toe when you are 28 week pregnant and weighs around 2.5 pounds. The skin is still wrinkled, but to a less extent. The lanugo hair starts disappearing, but some will present even after birth. The baby’s skin becomes plumper with two to three percent body fat. The hair on the head continues to grow. Eyebrows and eyelashes also continue to grow. The eyelids that remained shut till now will be opened during this week and the eyes will be completely formed. The eyes can perceive light. The baby’s nostrils will also open during this week. Your baby is now able to recognize your voice, so talk to your baby as much as possible. The baby’s lungs develop air sacs and it will take several more weeks for the air‑exchange sacs to form completely. The lungs will be able to breathe air. Apart from the lungs, all other major organs will start to function. The brain continues to grow and it grows larger. The nerve fibers are covered with fatty protective sheath, which allows the impulses to the brain faster. The baby’s muscle tone slowly improves and the bones harden at your 28 week pregnant. 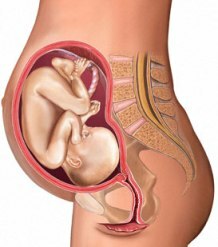 As the baby grows faster during this week, there will be less space in the uterus for the baby to move. The arms and legs are pulled towards the chest, which the baby feels as a comfortable position. If the baby is boy, the testes will begin to descend in this week. Your doctor will check when you are 28 weeks pregnant to see the position of your baby. If you have pre-term delivery now, there are 94-95% chances that your baby would survive. At your 28 week pregnant, you will experience symptoms such as leg cramps, varicose veins, hemorrhoids, heartburn, indigestion, aches and pains, itchy skin, swelling of ankles and feet, breast tenderness, shortness of breath, etc. Your uterus will be three inches above the navel in this week with your average weight gain around 20-25 pounds. As the uterus pushes on your bladder, you may experience frequent urination. There will be leakage of colostrum from your breasts when you are 28 weeks pregnant. Colostrum is sweet watery milk that precedes milk production. You may experience back pain, discomfort during sleep, etc., due to increased weight on your abdomen. The placenta will start transferring antibodies from you to your baby and your baby will born with immunity to certain diseases. Your doctor may do blood tests to know whether your blood group is Rh negative. If your blood group is negative and the baby’s blood group is Rh positive then you need Rhogam shot to prevent complications. Your health care professional will also order glucose tolerance test to test for gestational diabetes. From your 28 week pregnant, you will need to see your health care provider for every two weeks. Previous articleMonitor The Wellness Of Your Pregnant Baby With Prenatal Tests! Next articleHow To Deal With The Changes In Pregnant Breasts?